(SCOTTSDALE, Ariz.) – Larsen Gallery, one of the nation’s leaders in the secondary art market for more than 20 years, has added an Ida Kohlmeyer and a Maynard Dixon to the dynamic Larsen Art Auction at the 5th Annual Bentley Scottsdale Polo Championships: Horses & Horsepower at WestWorld of Scottsdale on Oct. 24. Relocated to the Polo Championship event last year, the Larsen Art Auction is one of the most beautiful live auction environments in the country. The painting Bright Morning by Maynard Dixon depicts Diana’s Throne in Mt. Carmel Utah where Maynard Dixon had his home and studio. In a seemingly contradictory move, the California native headed east to see the real West, traveling to Montana, Arizona, New Mexico and Utah, which is evident in his imagery. Bright Morning is expected to sell between $100,000 – $150,000 at auction. Kohlmeyer’s Boogie Woogie series pulls inspiration from Piet Mondrian’s famous Broadway Boogie Woogie painting that is currently in the collection at the Museum of Modern Art. In her version, Kohlmeyer used different materials applied to the canvas in grid lines, reflective of the Mondrian design. The result is abstract with its own language of hieroglyphics, shapes and signs. Boogie Woogie With Apologies to Mondrian #1 is expected sell for $50,000 – $70,000. Kolhmeyer’s Boogie Woogie With Apologies to Mondrian #1, which is the first of the popular series to ever be sold auction and Dixon’s Bright Morning join several Picassos, LeRoy Neiman originals and a Milton Avery in what is expected to be Larsen Gallery’s most valuable auction collection to date. All auction items will be on display at Larsen Gallery, located at 3705 N. Bishop Lane in Scottsdale, Arizona 85251, in advance of the Larsen Art Auction starting Oct. 1, and during the Larsen Art Auction Preview Party on Oct. 21. Please RSVP to rsvp@LarsenGallery.com no later than October 18. 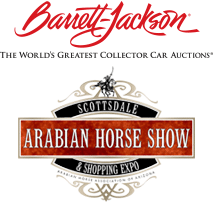 In addition to the Larsen Art Auction, the Bentley Scottsdale Polo Championships: Horses & Horsepower will feature a sneak preview of the 2016 Scottsdale Arabian Horse Show, an advanced look at the world-famous Barrett-Jackson 2016 Collector Car Auction, Phoenix Symphony quartet, field-side ballroom dancing and, of course, action-packed polo matches. The 2014 Larsen Art Auction produced impressive sales with a more than 84% sell through rate and welcomed bidders from 46 states and 33 countries. For more information, to view the lots available, or to register to bid for the 2015 Larsen Art Auction please visit the auction’s website at larsenartauction.com or contact the gallery at 480-941-0900. Media inquiries about the Bentley Scottsdale Polo Championships: Horses & Horsepower, or to schedule a media viewing of the auction items, contact Jennifer Parks at jparks@rosemoserallynpr.com or by phone at 480.495.3806.